We were on our way to see Morrissey at Kings Lynn, and Jacquie said we might as well visit some churches on the way. And so, we drove out of north Cambridge into the country of my childhood. And how much it has changed in these forty years! Cambridge was still a country town when I was a child. Now it is more like a great, modern city, its suburbs of office blocks and housing estates sprawling out to Waterbeach, the dear old A10 dwarfed by the massive junction on the A14, six lanes of traffic hurtling up and down from the vast circle. And then, beyond Waterbeach, the names! Landbeach, where the bus used to stop for a rest, or so I thought as a six year old. My mother would put me on the bus at Drummer Street, never doubting for a moment that the driver would look after me, and that my Granny would meet me at the other end when the bus stopped for a moment at the end of the long fen drove. Now, where the openness of the fen landscape first bore down on the lonely road out of Landbeach, the grey clouds scudding across the wide fields, there was a business park, anonymous multi-storey offices towering above the few remaining trees. We headed on through Chittering with its pretty Baptist chapel, and then Stretham with its spire. Soon, we were passing the village where I spent the first three years of my life. In the early 1960s, when I was born, my Granny had the first indoor plumbing in the street, put in by the Isle of Ely district council because there was a new baby in the house. Electricity had come to the village in 1953, when my mother was seventeen, but even as a child I remember the meat safes and accumulators still in use, and there were plenty enough outside lavatories. In those days, you could make out the rooftops of the village across the fields from the A10. Now, an anonymous housing estate shoulders right up to the road, the houses with mean little windows and satellite dishes all turned to the sky. I thought it was shocking; both the houses, and that so much of life should have gone in forty years. I was born in Ely, but I didn't recognise it now as we approached it. The A10 takes a wide curve around the old city; you get a glimpse of the great cathedral, and then you are whisked away westwards. The busy road slows to junctions with other busy roads that I remember as country lanes. The city has come out to meet the fen, and the intensive farming of forty years ago has given way to fallow fields, market gardening and scrub. Within two miles we saw no less than three dead foxes on the road, a mark of what happens when you change the balance of nature so vigorously. When I was a child, the cathedral was Ely. If you walked from my other grandparents' house in Chief Street, you naturally walked through the great nave and lady chapel on your way to the market. Everybody did it; the cathedral was as busy as the streets outside. Now, you have to pay to get in, and Ely is a tourist trap above all. We skirted around it, not stopping. Littleport, and then across the great river and into the proper fen, and for the first time I thought of Norfolk, just a few miles away now. We entered it at Brandon Creek, and then suddenly we were in Southery, the Saxon South Island, a gentle rise in the most southern part of the Norfolk fens, right out on the edge of the county. The village was more like a Cambridgeshire village than a Norfolk one; busy and awake, with the marks of of 20th century agro-industrial prosperity. We were also entering the carstone belt, which made the buildings seem even more foreign. Jacquie looked at the main street. "Are you really sure we're in Norfolk? ", she wondered. But all this made me like it. As often in this part of England, the village church is a 19th century work, by Higham and Robinson in 1858. The material was carstone with stone dressing, and the lead spire on the narrow tower gives it an urban feel. 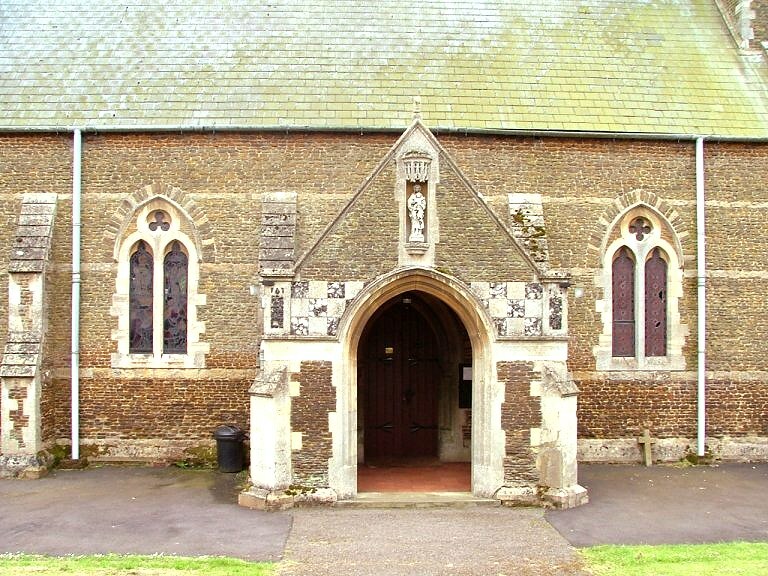 Some forty years later, a porch was added, and this is of particular interest because it was the work of the great Anglo-catholic Priest and architect Ernest Geldart. 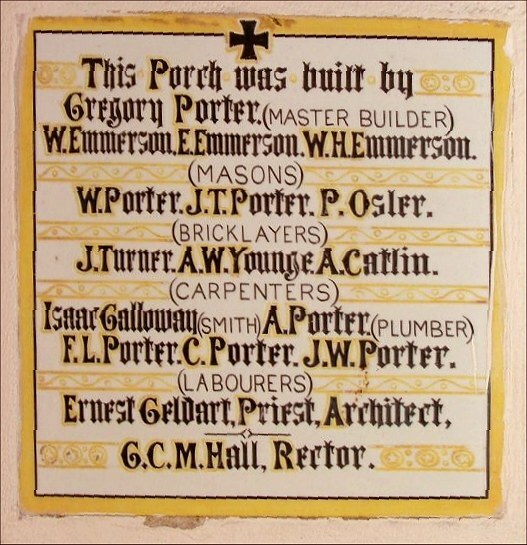 An enamel plaque records his name and those of all the workmen engaged in its construction. 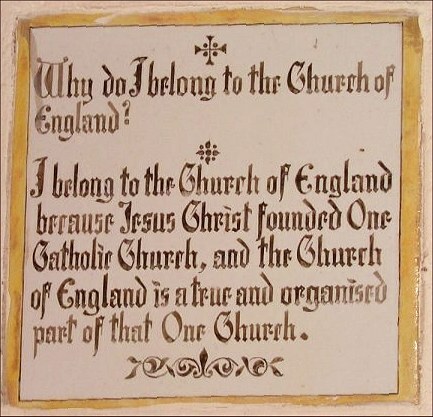 In the late 19th century, the fens were a hot bed of Anglo-catholicism, and evidence of this survives in another enamel plaque above the first, which reads Why do I belong to the Church of England? I belong to the Church of England because Jesus Christ founded One Catholic Church, and the Church of England is a true and organised part of that One Church. In fairness, they really did believe that their movement would persuade the entire Church of England to adopt Catholic belief and liturgy, and that this would be enough to ensure that the Holy See would embrace the Anglicans, recognise Church of England ministers as valid Priests, and take the Church into full communion with the Catholic church. It came as a real knock-back in 1896 when the gentle liberal Pope Leo XIII, a friend of Newman and apparently a friend of ecumenism, examined the validity of Anglican orders in some detail, and declared that they were absolutely null and utterly void. Before and after that time, the words on this plaque were the sort of faux-cathechism that the Anglo-catholics comforted themselves with. If you say it often enough you end up believing it, I suppose. It intrigues me that acceptance was so important to them, and it all seems very much like ancient history now. 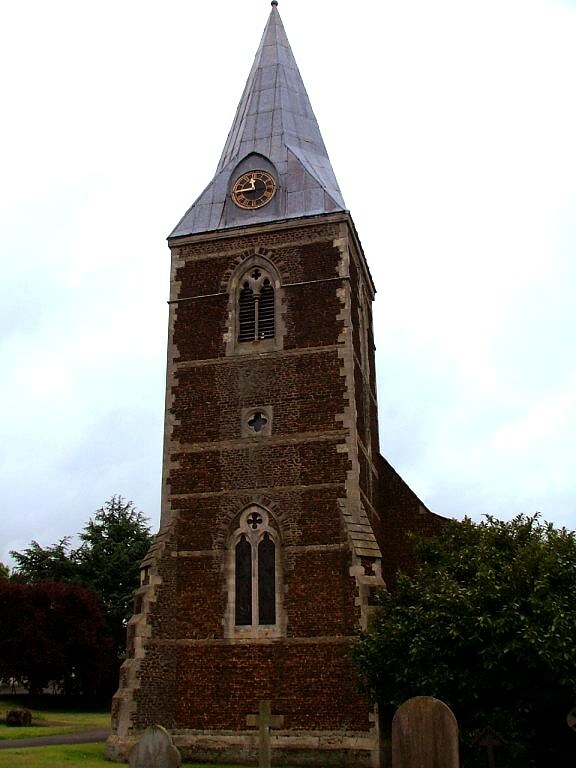 Churches in this part of Norfolk and Cambridgeshire are usually open, or at least have keyholders. But this one wasn't, and didn't. There wasn't any sign of life, and although it seemed unlikely that such a large village would not have a working church, you couldn't have told this from looking at it. 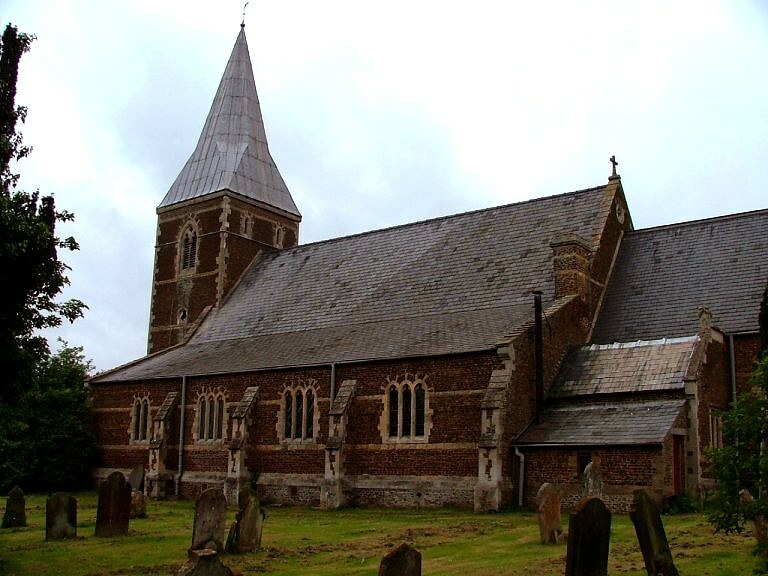 It was only at friendly, open Hilgay that I confirmed there are still services at Southery church. 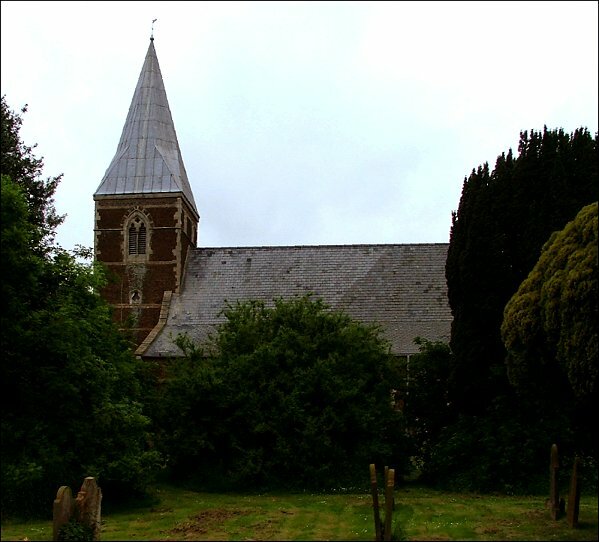 St Mary was built to replace the old medieval church, the ruin of which lies about a hundred yards away. We were going there next, but as I walked around St Mary it began to rain. I hurriedly took my photographs, but it was becoming heavier, and I would remain wet for the rest of the day. A locked church, intensifying rain, no keyholder. My goodwill rapidly disappearing, I rattled the door once more. No chance. So we left.